“Do e-cigarettes actually help people quit smoking?” The Moffitt Cancer Center in Tampa, Florida, is recruiting smokers who vape (i.e., dual users) for a clinical trial that, according to spokesman Vani Nath Simmons (here), aims to answer that question. Researchers will be using federal grants to convince smoker-vapers to quit smoking, and possibly to quit vaping, by sending them self-help booklets. The first study was conducted in Britain; the next two, in the U.S., were supported by National Cancer Institute grants totaling about $5 million over the period 2009-2013. According to the American Journal of Preventive Medicine report, the booklets helped smokers abstain in one cessation trial. They were mailed to smokers at two rates, standard (8 booklets over 12 months) or intensive (10 over 18 months with other mailings on alternate months). The control group only received one booklet at the beginning of the trial. At 24 months, 19% of this group reported that they hadn’t smoked in the past week. The non-smoking rate was 24% in the control group and 30% (significantly higher) in the intensive group. In 2000, Dr. Brandon reported that former smokers who received booklets had lower relapse rates than smokers who had access to a telephone hot line (12% vs. 35%). 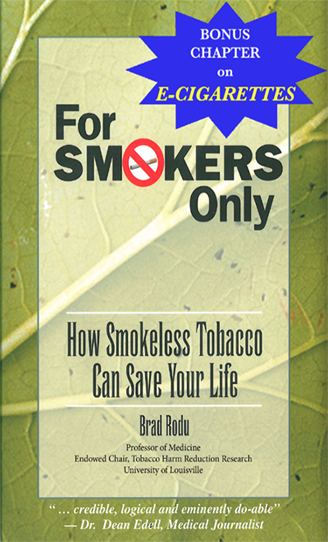 In the current trial, the booklets are modified specifically for vapers, as reflected in the title, “If You Vape: Guide to Quitting Smoking”. However, the formal description of the study, as filed with the NIH (here), includes among its objectives producing tobacco abstinence among subjects and terminating “their e-cigarette use as per traditional nicotine replacement therapy (NRT).” One hopes that this study will not embrace the disease-treat-cure model for influencing consumer behavior (here and here). Note: This post was updated with additional information on July 29, 2016. Free of government regulation, The Swedish Tobacco Experience has seen the use of snus (Swedish moist snuff) largely account for the lowest prevalence of smoking among men in developed countries for decades. A persistent misconception is the belief that snus is safer than American moist snuff or chewing tobacco. 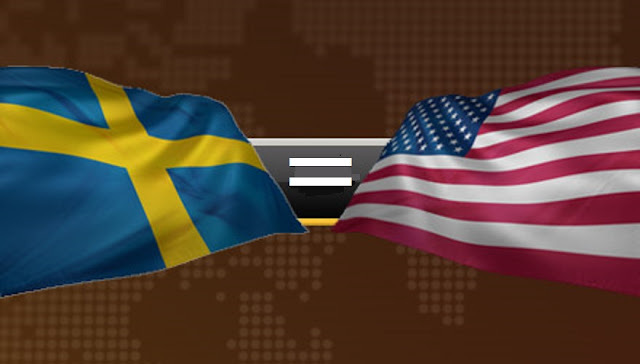 The belief is based on the fact that Swedish snus has lower levels of trace contaminants than do American products. I confirmed this in a 2004 study, co-authored by a scientist at the Swedish National Food Administration, demonstrating that Swedish snus had lower levels of tobacco-specific nitrosamines than American moist snuff products (abstract here); other research has produced similar results (here). Small differences in contaminant levels do not, however, translate into differences in health effects. This is shown in a comparison of the results from two comprehensive reviews of Swedish and American smokeless tobacco studies with respect to cancers (discussed previously in this blog here) and cardiovascular diseases (abstract here). Biostatistician Peter Lee conducted both analyses, and some relevant results are noted below. All of the studies are adjusted for smoking and alcohol. There are essentially no differences in risk for any of these diseases in the Swedish and American studies. New research on the relative safety of American dip/chew products (here) indicates that smokeless users who had never smoked showed no significant risks for numerous diseases. In summary, American dip/chew and Swedish snus are indistinguishable with respect to health impact. Smokers who switch to any of these products can make smoking history. U.K. E-Cigarette Perceptions More Accurate than U.S. Words, and honesty, matter in communicating public health advice. 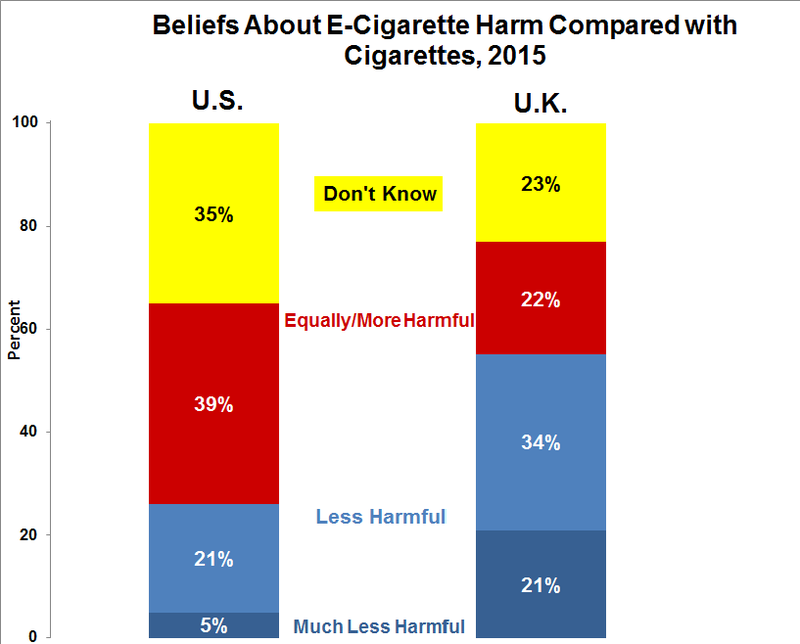 Today, survey data in the U.K. and the U.S. demonstrate the effects of truth-telling versus obfuscation regarding e-cigarettes. I have previously noted stark differences in the characterization of e-cigarette use by health authorities in the two countries (here). Evidence-based assessments by Public Health England (here) and the British Royal College of Physicians (here) encourage smokers to switch to e-cigarettes, while government agencies and trusted medical organizations in the U.S. obscure the relative safety of e-cigarettes. Reflecting the above, new surveys demonstrate that 55% of adults in the U.K. correctly believed in 2015 that e-cigarettes were less harmful than cigarettes, while only 26% of Americans held that view (see the chart). The British survey was conducted by Action on Smoking and Health U.K. (here). I generated the U.S. numbers from National Cancer Institute Health Information National Trends Survey (HINTS) data (available here). There were minor differences in the wording of the survey questions, but I think the results are comparable and informative. While the U.K. results aren’t ideal, the U.S. results are deplorable and must be attributed to the misinformation campaign waged by public health authorities. Tobacco prohibitionists continue their pursuit of a “tobacco-free society” or “tobacco endgame”, supported by a regulatory scheme that transfers hundreds of millions of dollars annually from tobacco manufacturers through the FDA and NIH to anti-tobacco researchers and institutions (here). Unlike the U.K., where prestigious medical societies and experts routinely share the scientific facts about e-cigarettes, there is no balance in the U.S. to the tsunami of misinformation. Given this, it is remarkable that even one-quarter of Americans know the truth about e-cigarettes, and that 2.5 million former smokers currently use them (here). Smokeless tobacco products, chewers and dippers have been targets of a similar misinformation campaign for 35 years; the HINTS survey demonstrates the effect of that effort. Asked if smokeless tobacco products were less hazardous than cigarettes, only 11% of participants correctly answered “yes,” 67% responded “no” and 22% didn’t know. In other words, 89% of Americans have no clue that dipping and chewing are 98% safer than smoking. Anti-tobacco propagandists are directly responsible for this dismal statistic. Misinformation keeps people smoking and keeps smokers dying. 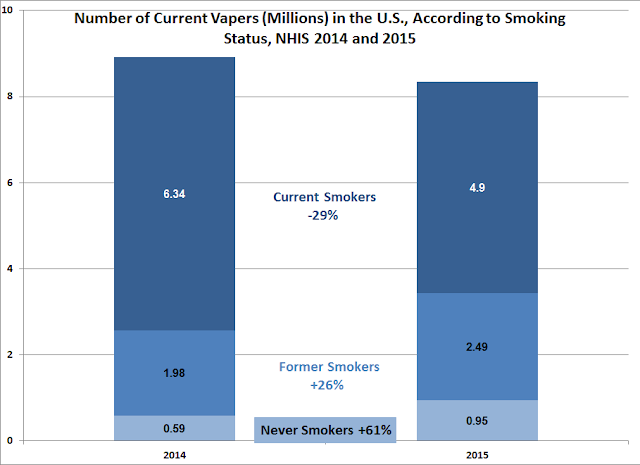 The Centers for Disease Control and Prevention’s 2015 National Health Interview Survey – the source for national smoking estimates – reveals surprising e-cigarette facts, summarized in the chart. These figures demonstrate a 7% drop in current vapers from the 8.9 million reported in 2014 (here), due largely to a 29% decline in the number of current smokers who vape. In the NHIS survey respondents were current smokers and/or vapers if they used products every day or some days. In both years, 22-23% of current smokers vaped every day; the rest reported vaping, on average, about 7.7 days in the past month. Year to year, the number of former smokers who vape increased 26%, from nearly 2 million in 2014, to almost 2½ million in 2015. The majority of former smokers (63% in 2014, 66% in 2015) vaped daily. Former smokers who vaped some days averaged 7.8 days in the past month. In 2015, there were nearly 1 million current vapers who had never smoked cigarettes, a 61% increase from the previous year. Most of this group vaped only on some days (5.5 days in the past month), although daily vaping increased from 16% in 2014, to 21% in 2015. As for cigarette smoking, the NHIS recorded a large decline in prevalence, from 16.8% in 2014, to 15.1% in 2015 – a 10% drop in just one year. As I noted previously (here), in 2014 the number of Americans who smoke dropped below 40 million for the first time in the 50 years that the NHIS has provided smoking statistics. In 2015, that number declined further, to 36.5 million. The largest single-year decline in adult smoking was seen in the youngest age group, and it follows the substantial recent decline in teen smoking reported in this blog (here) but ignored by the CDC and other federal agencies. The 13% smoking rate among 18- to 24-year-olds in 2015 represents a decline of almost half from 24.4% in 2005. This will eventually translate into significant public health gains, as lower smoking rates among young adults today will result in lower smoking-attributable disease and death rates in the future. *Research note. Information about e-cigarette use was missing for 6% of respondents in the 2015 NHIS, so population estimates were adjusted accordingly. I would like to thank Carl Phillips for his insights and assistance with this post.